My early April CSA vegetable box came a week ago and showered us with a mountain of fresh greens, just as I expected. And again, I had great fun using up this bounty in all sorts of different ways. The thing about green leafy vegetables is that they can look formidable in their raw form. But they cook down so dramatically- put them in a saute pan and a big ol' pile of big green leaves is reduced to a few tablespoons in minutes. It is easy to add greens to just about any dish that I'm cooking. 1. Spinach. I had some brussels sprouts on hand and wanted to make something warm, cheesy and comforting for a rainy evening's supper. I ended up making a gratin loosely based on this recipe. As the cheese sauce was almost done, I stirred chopped spinach into it, and it wilted instantly. 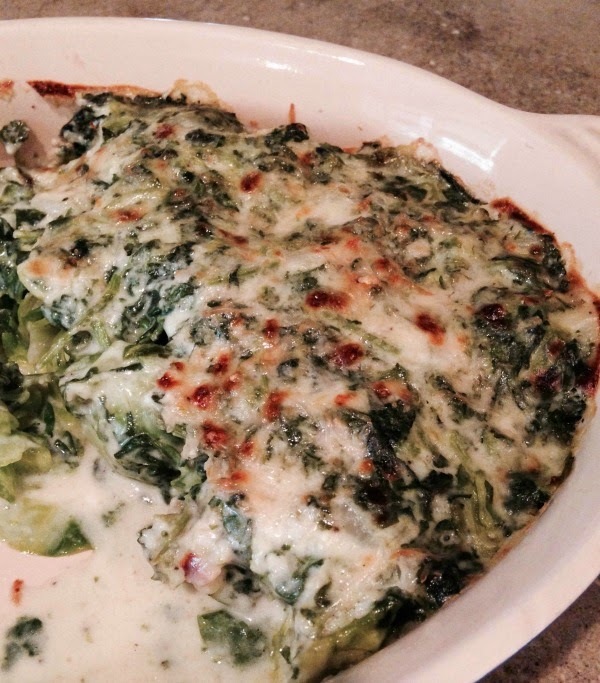 Then I poured the spinach bechamel sauce onto blanched brussels sprouts in a casserole dish and baked it. The result was wonderful. I did the menu mash-up that I often do and served the brussels sprouts spinach gratin with a vegetable-heavy egg and mushroom pulao. 2. Arugula. This is the delicate leafy vegetable with a very distinctive peppery flavor and is known as rocket in some places. I used the arugula in a version of this egg and potato dish, a favorite recipe that I posted 10 years ago! Saute 1 minced onion and season it with salt, ginger and garlic. Stir in 2 medium shredded potatoes (squeezed to remove excess water) and 1 big bag (yes, that's a technical unit of measure right there) fresh arugula. Saute until potatoes are tender, then pat down the mixture. Beat 5 eggs with salt, pepper and 1/4 cup shredded parmesan or cheddar cheese, pour the eggs on the vegetable mixture. Cover and cook until the eggs are set. Cut into wedges and serve. 3. Salad mix. This was a mixture of different salad greens and the taste was unbelievable. Tasting farm fresh greens- some sweet, some peppery, some mildly bitter- is a game changer and can convert you into a salad lover very quickly. We enjoyed the greens dressed simply with Caesar salad dressing. 4. Beet greens. (Or at least I think they were beet greens). My quilter friends dropped in for a sewing session and stayed for lunch, and I made some vegetable curry- basically matar paneer minus paneer and plus other veggies that I had on hand, and served it with greens jeera fried rice. You guessed it, this is just beet greens sauteed with cumin, then tossed with cooked rice. It works, folks. Greens make everything taste better. 5. Turnips. Roasting is my tried and true method for dispatching just about any vegetable so I gave it a try by making turnip fries. They were fine, nothing special. If I get turnips in the next box, I'll give it the Indian treatment to see if I like that better. 6. Snap peas. In my previous veggie box post, a reader left a kind suggestion that I try a dry subzi with sugar snap peas. I did just that with wonderful results- this might have been the best thing I made all week. 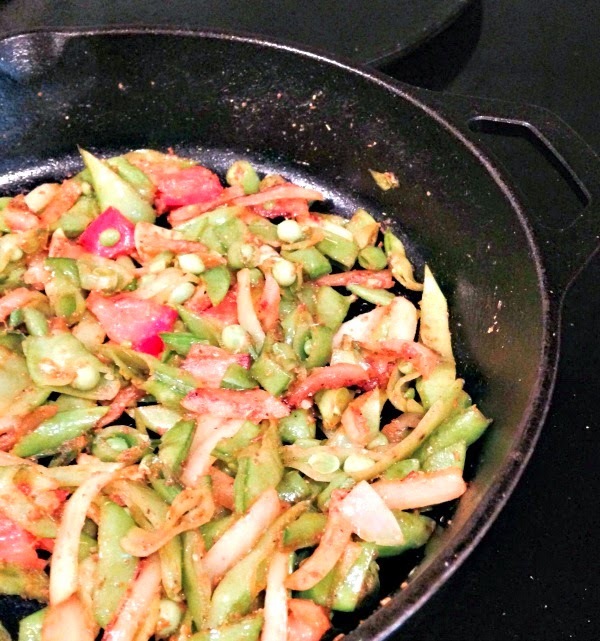 Here's the recipe for a quick garlickly sugar snap peas subzi. It goes well with a homestyle Indian meal. Make this subzi in a hot cast iron pan or kadhai for best results- the quick stir frying on high heat keeps the veggies tender and very flavorful. Wash sugar snap peas and cut the pods into 2-3 pieces each on the diagonal. Saute 1 sliced onion until translucent. Add 4-5 cloves garlic (sliced thin), turmeric, red chili powder, cumin coriander powder, salt. Optionally, add a diced fresh tomato. Add sliced pods and stir-fry until just tender. Here's a brief recipe for the instant dosas. If you're drowning in zucchinis come summer, bookmark this recipe because it works beautifully with zucchini too. Peel and shred 3 cucumbers (no need to remove the seeds) into a bowl. If the cucumbers are very watery, pour out some of the excess water from the shredded cukes. Cut mint leaves into thin ribbons and add them to the bowl. Add 1/2 cup ragi flour, 1/3 cup besan and 2 tbsp. rice flour (approximate quantities). 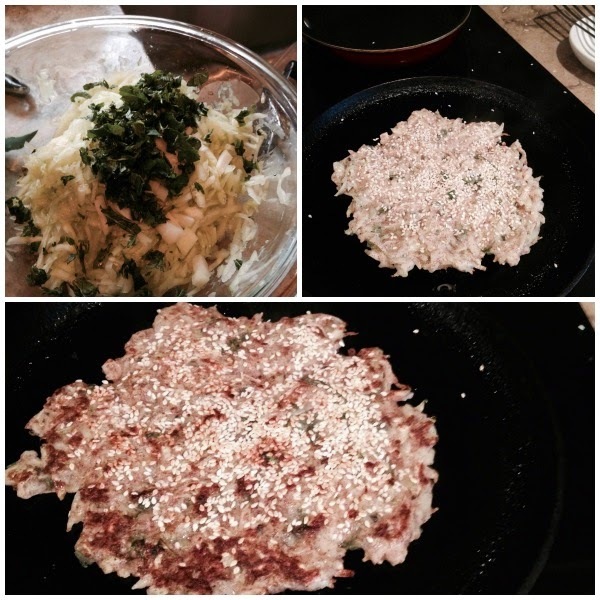 Season with cumin seeds and salt, and optionally minced chili. Mix into a thick batter. You'll need no water; the salt will draw more than enough water from the cucumbers. Heat an oiled griddle and pour on a ladleful of batter. Use the ladle (or better yet, your fingertips) to spread it around carefully. Sprinkle with sesame seeds. Let one side cook until golden brown, then flip carefully and let the other side cook until golden brown. If cooked patiently on a fairly low flame, the dosa is crisp on the outside and wonderfully soft on the inside. 8. Kale. There were a couple of handfuls of kale that I made into a quick kadhi. Finally, the box had some other little herb bundles (sage, thyme etc.) that I still haven't used. And there was a bottle of the farm's homemade hot sauce. Can you tell I'm loving the veggie boxes? But seriously, I am thoroughly enjoying being more active. My weekly routine, more or less, is one swim session, one zumba class, and two fitness classes that have 30 minutes of stretching followed by 30 minutes of strength training. This covers 4 weekdays. I look forward to all of this, but the zumba class is my favorite. The instructor is absolutely adorable, the music is energizing, I laugh heartily at how ridiculous I look, and that one hour class elevates my mood for days. Why did I miss out on this fun all this time? At work, when my boss saw that I was serious about standing at my desk (I propped up my two monitors and keyboard with boxes and thick books for 2-3 months), he authorized a real proper adjustable standing desk for me. It came last week and I love my swanky new set up. On weekends, we look for opportunities to get out and go for long walks and to parks and playgrounds, especially now that the weather is nicer. But I definitely laze around and some rest too, or what passes for rest when you have a 3 year old kid and 2 year old puppy at home. Have a great week, friends. Tell me what you've been eating! I've pledged to eat lesser carbs and TH is keeping a close watch on me to make sure I stick to my word :) I'm allowing myself some ragi in the form of drinks and maybe a little oatmeal for breakfast. I've lost 2 kgs in the past two weeks. Made a lovely sauteed purple cabbage last night - EVOO, garlic and cabbage. Threw in some crumbled paneer and it was so good! I'm having the leftovers for lunch today. Good for you, Jo! Cabbage and garlic- mmm. I am so enjoying your CSA series. We live about 3 miles from a farm in Southern California so I was super excited to start getting a CSA box. I got it religiously for a year. But I've been blessed with 2 vegetable-hating (actually they just don't like to eat in general ;-)) toddlers and my husband is frequently away for work. So it was too much for just me. I love seeing ur creative meal ideas. I just wondered - do u prep all ur veggies the day u get the box? I am always in awe of how u consistently cook up up such awesome meals with ur busy schedule. Prashanti- No, I don't prep all the veggies when I get my box. The "sturdy stuff" like turnips and snap peas just get put away until use during the following week. Salad greens I do wash and spin down and store in an airtight box, ready to eat. Sturdy greens stay in their bags in the crisper until use, and seem to be fine. Herbs get wrapped in paper towels and stored in a box in the fridge. My husband's been away all last week too, so it was just my daughter and I working through this box. But she loves salad, and we had friends over to share a few meals. Getting the CSA box every other week rather than every week is working out well for us. Nice to hear about your veggie box Nupur! My favorite way of using up greens is making a "kootu". I boil greens (or veggies such as cabbage, squash etc) along with cooked dal (masoor or tur). Then I add ground coconut, jeera and red chillies. I use up kale a lot with this recipe of South Indian kootu. We have it with rice. I love kootu- will make some with this week's box! Thanks for the idea. This post made me happy for so many reasons. You are doing amazing with the veggie box, everything looks delicious and I got ideas to use up the collard greens and two huge bunches of spinach in my fridge. I am excited to know you are enjoying exercise just like me, I also wonder how and why I kept away from it for so long. I find Zumba most fun too, I also enjoy weight training. I have reached a phase where my body is actively communicating with me as in it rewards me instantly when I treat it well and reacts to let me know if it didn't like something I did, it's being extremely cooperative and I am thankful for that. I am thrilled to know you are getting fresh eggs!!! That's just awesome. How lucky!!! Oh and those multi-colored eggs in assorted sizes look so good! :-) do you notice any difference in taste? Not much difference in the taste, but the yolks are bright orange! I love them. what a lovely roundup of the CSA box menus you made Nupur. Your posts always, always leave me buzzing with ideas for our own diabetic friendly menus and a smile to boot. (your zumba experience has me chuckling because thats exactly how I used to feel when I did attend one several years ago). 1. Low fat(my mum also has gallstones apart from diabetes so most of my food these days is also low fat) mushroom curry in a tomato onion based served over miracle noodles. 2. Avocado, parsley and lettuce soup with a dash of low fat sour cream. 3. sweet chili peppers, cheddar and scallions quiche with home made quiche base(a first for me since I've usually avoided trying my hand at it but was successful so alls good except for a lot of flour dust on my kitchen floor:-)). This was for my son who adores a good pie- savory or sweet, any will do. 4. Brown rice and yellow mung dal idlis. Was aiming for a healthier version because my son and mum both do not digest urad dal very well but do ok with yellow split mung dal. They turned out ok, a tad denser than I'm used to but still delicious. Served with a coconut mint chutney. 5. 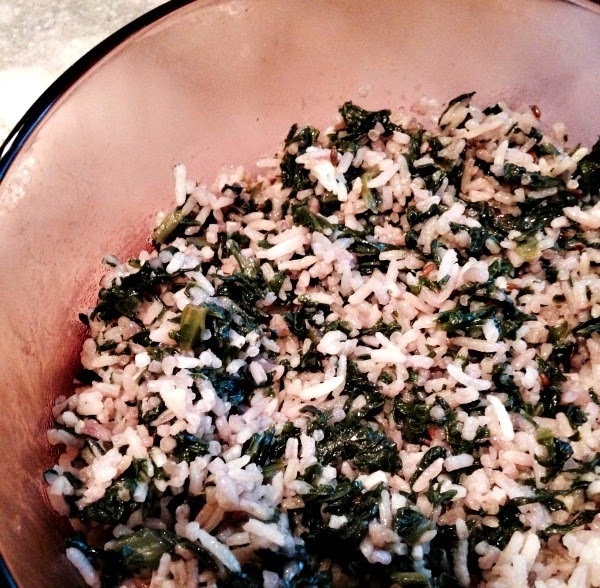 Wild rice, greens and hemp seeds pulao. I had a pack of wild rice sitting in my pantry for ages because I didn't know how to use it but was easy to cook up and tastes darn good. Cooking for my mum in a healthier and diabetic conscious way has opened up so many culinary vistas for me, it's amazing. But the best part, the whole family is benefitting. We're otherwise fish and meat eaters. Mostly fish since we hail from Goa but have drastically cut down on both since she arrived and both she and I are now 99.999% vegetarian which suits us much, much better. You're eating well, Deepa! The avocado and lettuce soup sounds particularly delicious. Good for you for making these changes and being happy about them, more importantly. I'll try that- I love radish sambar and turnip sambar is a great idea. Arugula is my favorite greens. I have never cooked it down though. I love arugula salad with some oranges, raisins, crumbled gorgonzola and toasted almonds. I had this first in my company cafeteria and was hooked. I will try cooking it with potatoes next time. I dont do eggs, so maybe I will try it similar to potato-arugula hash brown. Also, arugula pesto tastes great. And you are right, greens make everything better. The only way I can eat turnips is in a sambar. By themselves, I find the taste too assertive. And roasting brings out that taste even more. Our farmers market loot from this weekend was- 2 bunches collards, chard, bag of spinach, butternut squash, carrots, baby radishes, cauliflower and cabbage and some glorious salad tomatoes. And a basket of strawberries. We also procured some duck eggs (for the hubby) from the market. Looks like a LOT of produce but somehow between the 2 of us and an 18 month old, we manage to finish all this in a week! Neha- There was some arugula in the salad mix as well and it was so good. I'll have to try arugula pesto! Yours is the second vote for turnip sambar so I think I will make some this week. 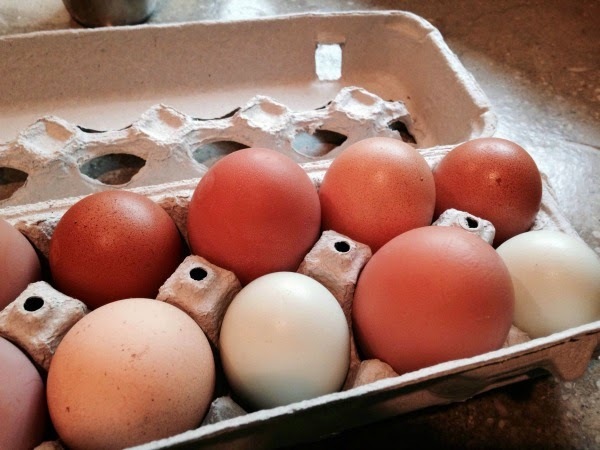 I've never tasted duck eggs- not adventurous enough :) Your market loot sounds wonderful. We got through a lot of produce too, it is what I spend 90% of my food $$ on. I was going to say that rocket pesto is lovely, but I see that someone else has already mentioned it, Nupur :) The sugar snap peas subzi is something I'm going to try. Although I do love to snack on it raw, too. I'll definitely have to try rocket pesto, Shammi! Yup, gotta think out of the box LOL. So true that greens can embellish all our old favorites and make them even better. Sireesha- I've always been a morning person- it is just my nature. Evenings are the tiring time for me I start shutting down after 6 PM and fall asleep as early as 9:30 PM! Jui- I'm so sorry about your mom. That must be hard. It is true that life is short and the years fly by. I am so glad you're enjoying graphic novels. It blows me away how simple pictures can tell complicated and emotional stories. Love these talented artists. Yes graphic novels are so lovely. The first i read was Laika about the dog sent up in space by russia during the sputnik 2 project. It is a very touching story & a must read for all dog lovers. I strongly recommend it. for my budget but I guess in the long run it will be well worth the money. Though I don't know if that is a local store. I might have to search for it by name/brand/description here ..
Vinita- I love the desk, it is exactly what I was looking for. It is an online store. Thanks for the meal ideas, Nupur. I made the avocado smash and egg for breakfast today and it was tasty and filling. I added a little dash of ranch dressing for some taste. Joyce- I'm glad you enjoyed avocado and egg- it is my go to breakfast these days. Update - I made mash turnips, chard egg curry (kid didn't like it) we did, mac & cheese trees recipe made it twice over 2 weeks. Made with pasta one week and with just veggies another week. 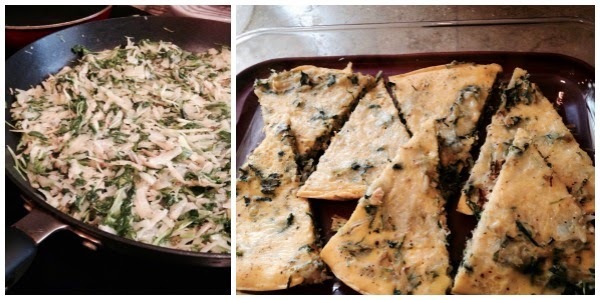 Both were a huge hit and I served with bechemel sauce and also tried spinach bechemel. No one complained :-) Also made no boil lasagna with eggplant and spinach. Very good. Thanks for all the recipes..
Meena- I can't believe you've been cooking all those dishes from my posts! I love your idea of storing salad fixings in the fridge to mix up in different ways. Got to do this in summer! Hey Nupur, loving all the latest posts on healthy living. I usually watch what I eat, but it's good to have someone 'police' you online. Thanks for reminding us each week to keep at it. I suffer from back pain due to an old injury and sitting at work doesn't help. I looked into standing desks - based on some research at Cornell, it may be too strenuous for your body to stand and work on a computer. They suggest sitting for 20 mins at a stretch and standing for 2 mins. I'm going to try this method. Probably a reminder on the computer will help. Thanks Snehal! Good luck and I hope your back pain goes away. It is tough to deal with that.